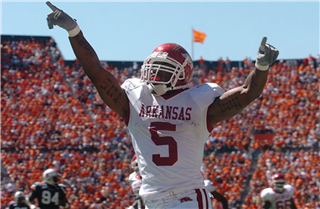 FAYETTEVILLE — Two time Heisman Trophy runner-up Darren McFadden headlines the All-Arkansas SEC teams as voted on by a panel of the Arkansas Democrat-Gazette sports staff. McFadden, a Little Rock native and the SEC’s No. 2 alltime rusher with 4,590 yards, was one of 10 unanimous first-team choices by the voters.